The basis for this policy option comes from a paper by Ridley, Grabowski, & Moe published in Health Affairs in 2006. The authors propose that developers of treatments for neglected diseases receive a “priority review voucher” to incentivize production of these therapies. If a treatment meets certain criteria, the developers would be awarded a transferable voucher that entitles the holder to priority FDA review for another drug (or perhaps multiple drugs) and other possible incentives (Ridley, Grabowski, & Moe, 2006). 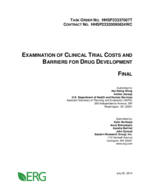 Ridley, Grabowski, & Moe (2006) estimate that a priority review voucher “would be worth more than $300 million for a potential blockbuster drug, because it would shorten the time FDA takes to analyze data from an average of eighteen months to about six months.” Capturing this impact in the framework of our clinical trial cost model is quite straightforward, assuming the trial being modeled is the one for which the priority review voucher is being used; we simply set the review phase length equal to six months (0.5 years). Aside from reducing the time costs of the trial, this change also increases the NPV of the revenue side of the model by reducing the period of time over which revenues are discounted. This barrier mitigation strategy reduces the time to market thereby increasing the expected NPV (eNPV) of the sponsor but does not reduce the cash outlays for doing clinical research according to our model.